West Africa is undergoing a nutritional transition which has been triggered by a rapidly urbanising population with changing dietary habits and decreasing levels of physical activity. While the prevalence of overweight and obese adults has rapidly grown in all countries, there are significant differences between rural and urban areas. 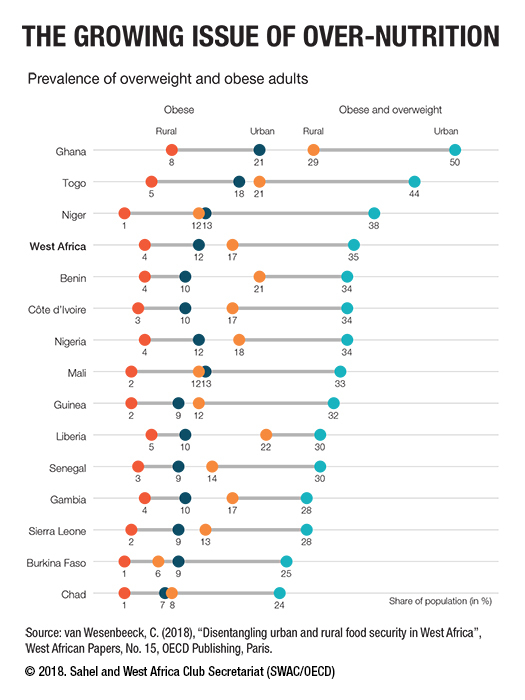 In Niger, for example, obesity prevalence is 13% in urban areas and 1% in rural areas. Overweight and obesity are occurring most rapidly in conjunction to accelerated economic growth translating into higher living standards and sedentary lifestyle. One in two Ghanian urban dwellers is already either overweight or obese. Overall, overweight and obesity issues in urban areas are almost as significant as for undernutrition, highlighting the increasing challenge from the double burden of malnutrition that these city areas face. These findings call for greater research efforts to identify more appropriate metrics to monitor food and nutrition security in urban areas.